Since the construction of the Oak Street Connector almost 50 years ago, the Hill-To-Downtown neighborhood continues to be burdened by the scars of urban renewal land clearances which left the district punctuated with large surface parking lots. The two proposed apartment buildings, referred to as “Parcels 9 and 10” will constitute the second phase of developer Randy Salvatore’s plan to transform the desolate area between Congress Avenue and Church Street South into a dense, revitalized neighborhood of apartments and amenity spaces. Parcel 9, located between Congress and Washington Avenue, will be a six-story, 152,000 square-foot building with 90 apartments: 70 one-bedroom units, 15 two-bedroom units, and 5 three-bedroom units. Directly across the street, between Washington and Lafayette, Parcel 10 will be a six-story 126,400 square-foot building including 104 apartments: 85 one-bedroom units, 14 two-bedroom units, and 5 three-bedroom units. Each building includes amenity space on ground floor and second floor featuring recreation, fitness, and study areas. Additionally, rooftop decks on each building will provide residents will unobstructed views of the city. Like siblings, the two buildings resemble each other but are not identical. Sharing the same large 8 x 8 windows, Parcels 9 & 10 are easily recognizable as related, however, the use of materials on each development sets them apart from each other. Specified by RMS Companies, the same palette of cementitious siding and paneling will be used for both buildings but the different use of horizontal and lap siding patterns will provide differentiated façades. 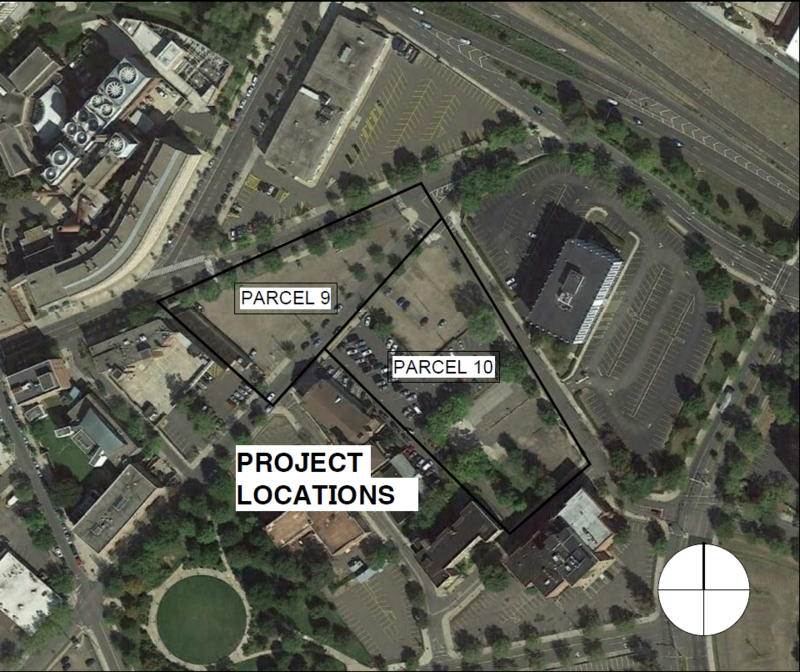 Additionally, separate colors schemes, two hues of gray on Parcel 9 and blue and tan on Parcel 10, will also be used to further distinguish the buildings. While designing Parcels 9 & 10, Kenneth Boroson Architects aimed to create an immediate urban setting by defining strong street edges of Congress, Washington, and Lafayette with the new developments. Pulling the buildings tight to the street also maximized the number of the units in each building based on increased parking availability. A glass fronted lower level can be utilized as potential commercial space when there is future demand. The proximity of the two sites presented Kenneth Boroson Architects the rare opportunity to create an instant urban fabric. Due to the unique facing sites, the design not only considered the sites themselves, but also the expanse between them. The tip of the Parcel 9 site, where Congress and Washington intersect, will be a landscaped garden and dog park which will help activate the street front around the developments. Anticipated to be completed in fall of 2019, Parcels 9 & 10 will propel the next phase of the transformative Hill-to-Downtown Community Plan. The residential and potential commercial space will help ignite urban activity in area of the city that has been defined by desolate parking lots for almost half a century. Parcels 9 & 10, and future developments of the like, will help to interweave the isolated districts of New Haven into a cohesive, vibrant community.